An important historical site, Fort York offered the British Army a distinct advantage during the war of 1812 in repelling the advances of the invading Americans and paving the way for the establishment of Canada as a country. Today, this significant site is all but inaccessible, cut off from the City by highways, rail corridors and development. The bridge design redresses this imbalance and restores the site to its proper stature. 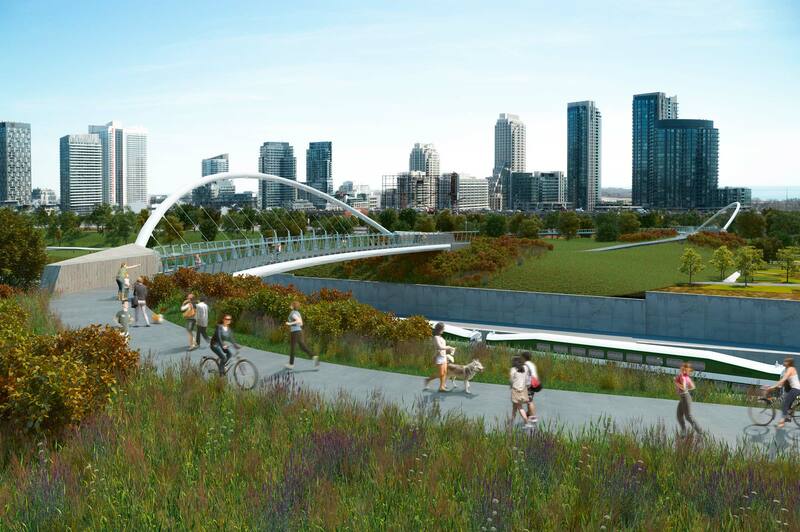 The bridge provides a much needed “north-­‐ south” connection to allow newly intensified neighbourhoods access to green space and the waterfront. Upon completion, the Bridge will offer excellent vantage points from which to see how the City has grown from its origins at the mouth of Garrison Creek. Following the serpentine path of what was the Garrison Creek, the structure spans two 150 metre distances. It consists of a single tied-arch where the arch rib is inclined in opposition to the curve of the bridge deck to create a balanced structure. Stainless steel cables transfer the loads of the deck through to the arch. Concrete anchor piers supporting the arch ribs are shaped to represent an abstraction of boulders, as if left behind by the dried up creek bed. Railing posts march along the deck surface, and, in addition to meeting the requirements for protection, represent an abstraction of Butler Rifles, commonly used during the War of 1812. Our involvement in this project began in 2008. In collaboration with Stantec, we successfully completed the Municipal Class Environmental Assessment Study for the City of Toronto. In 2010, Montgomery Sisam working with Aecom was selected for the design and construction. Although the project was canceled due to funding, our design won the 2011 Toronto Urban Design Awards of Excellence.